UEFA’s ‘other’ competition, the Europa League, begins on Thursday, with 48 teams starting their journeys toward spring final in Basel, where one club will earn a berth in the 2016-17 Champions League. 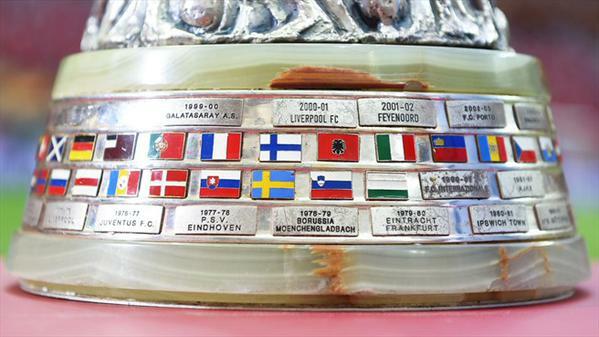 The groupings start off with what could be the toughest of the lot: Ajax (Netherlands), Celtic (Scotland), Fenerbahçe (Turkey) and Molde (Norway). 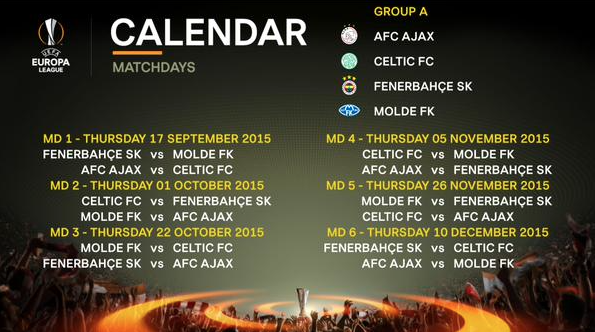 Ajax and Celtic shifted into this competition after UEFA Champions League playoff round defeats. Their rivals entered after third qualifying round losses – Fenerbahçe lost out to Shakhtar Donetsk (Ukraine); Molde to Dinamo Zagreb (Croatia). Ajax have made it through to the round of 32 in all three of their previous UEFA Cup and Europa League group stage campaigns. I see that trend continuing this season. Ajax have long had one of the best academies in Europe, and a recent product to keep your eye on is midfielder Davy Klaassen. Klaassen replaces the departed Niklas Moisander (transfer to Fiorentina) as club captain. Another academy product leading the scoring charts is winger Anwar El Ghazi. El Ghazi spent time in the youth academy of Feyenoord and Sparta Rotterdam before going to “finishing school” at Ajax. He’s started the domestic season on a tear, scoring six times in five matches. Fenerbahçe had a busy summer in the transfer market, signing former Manchester United players Robin van Persie and Nani. It will be hoped that van Persie can replace the goals of the departed Moussa Sow (transfer to Dubai side Al-Ahli). With that added experience and firepower, not to mention the intimidating home atmosphere, Fenerbahçe are the team to beat in this group. Celtic will have to find a way to improve both their set piece defending and their ability to close out games once if they hope to progress. Compounding their issues is the loss of center back Virgil van Dijk (transfer deadline day move to Southampton). Manchester United prospect Tyler Blackett arrived on a season-long loan, and having put in some impressive performances last season, Celtic will be optimistic that he can replace van Dijk. Molde are struggling this season after winning the Tippeligaen in 2014. Manager Tor Ole Skullerud was fired after the club lost in the third round of Champions League qualifying. They are well off the pace domestically, trailing leaders Rosenborg by 21 points. Despite the struggles, Molde still possess some capable attackers in Mohamed Elyounoussi, Ola Kamara and Tommy Høiland. Being in late season form could help.